At this time of year there are two birds that really herald the arrival of spring to me: the Eastern Phoebe and the Killdeer. You could argue that Common Grackles, Red-winged Blackbirds, the American Woodcock we never see, are also fine signals. But practically speaking the first birds that we see regularly are the Phoebe and the Killdeer. We've seen the first of each over the last week or so, a bit later than normal I think. Soon it will be time for the early warblers, Pine, Palm, Yellow-rump and Louisiana Waterthrush. They've been reported at a few locations throughout Pennsylvania for the last few weeks but we haven't seen any, no matter how hard we tried. Better to wait and enjoy them when we do see them. 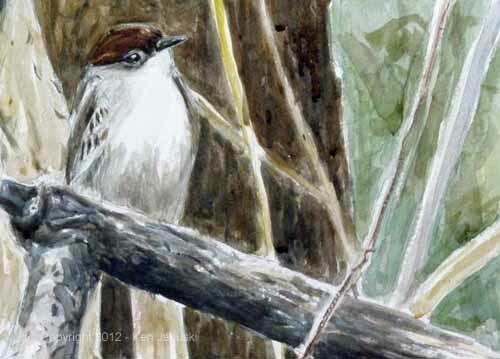 My paintings and drawings of Eastern Phoebes from this time always seem evocative of the season. There are no leaves on the trees. There are just bare limbs and often a gray sky. In that setting the rich brown of the Phoebe's head is striking. Later it will be a dull bird amidst the vibrant colors of late spring and early summer. Like the Killdeer those rich browns are plenty for now. 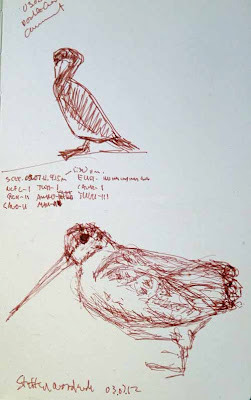 I've also done a few field sketches of Phoebes and Killdeer over the last week or so. But they're nothing special. So instead it seemed better to try a watercolor based on some photos I took yesterday of this Eastern Phoebe seen at Andorra Natural Area, a part of Fairmount Park in Philadelphia. Just the other day I remarked on how swimmingly the edition of the Downy Woodpecker and Canada Goose had gone. None of the typical problems with ink consistency. But today things were back to normal or even worse. I just couldn't keep the fine detail in this print of a Twelve-spotted Skimmer with Solitary Sandpiper. I still like it but it's a bit broader than I'd intended. I've yet to figure out what prints need to be tossed from the edition I pulled today. I pulled 18 prints but my guess is that the signed edition will only include between 12 and 15. I do really like this subject. So who knows? Maybe there will still be a larger painting sometime in the future. 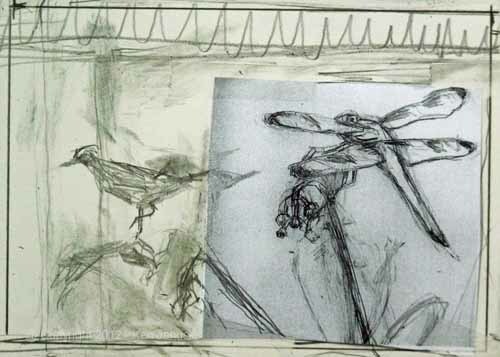 A few weeks ago I wrote a post about using sketchbooks as the source of more developed work. 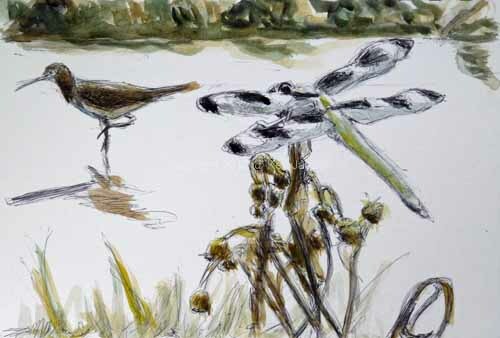 I showed a new watercolor sketch based on field sketches of Twelve-spotted Skimmers and Solitary Sandpipers both seen on the same day at Morris Arboretum last summer. The sketch was not complete or finished. But I thought it had a lot of possibilities as a more developed work. The main area I felt that I needed to work on was the foreground and to a lesser extent the background. I had objects in two different planes in space: the dragonfly and the bird. I felt that I needed something for the dragonfly to sit on that both held him and added to the design of the picture. I wasn't really satisfied with what I'd done in the watercolor. 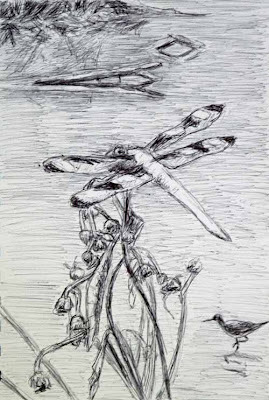 So I started sketching the dragonfly and the dead flower that it had been sitting on. The flower had extravagant curves, in both flower and dead seed head, that were infatuating. So I wanted to get them in if I could. The trick was to get them in without having them dominate everything else. When I had a sketch I was happy with I scanned it and made some prints of it. I then pasted in into my sketchbook and drew in the rest of the sketch, as you can see above. 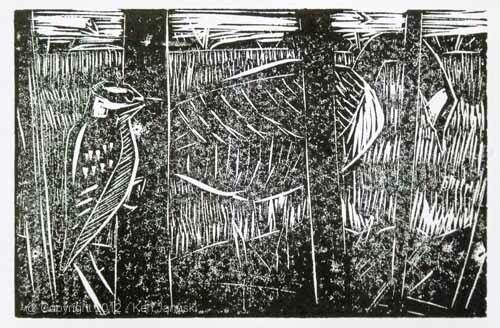 Eventually I then scanned it, reversed it and copied in onto a small 4x6 inch linoleum block. 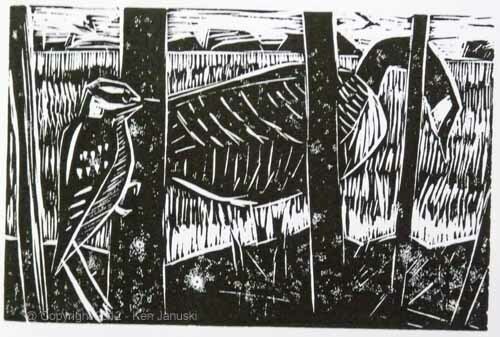 I've spent most of the day cutting this lino. After getting it to where I was fairly happy with it I switched to the paper I was going to print on, Rives Heavyweight, and the ink I planned to use, Caligo Safe Wash. Unfortunately the ink is too heavy and is covering up some detail, especially in the bird and dragonfly. So the next step is to recut some of the more subtle lines and hope that the ink has thinned out a bit. After that I may do a bit more work on the far shore. But there's not much lino left. I've cut a lot away. So I'll be cautious, I hope, with any remainging changes. As with the watercolor sketch I like the idea of combining two things that I saw in the same day in the same location, though not in this exact view. It's part of what makes art enjoyable. I don't hang out with printmakers. But I get the feeling that with some, just as in any other specialized field, there can be a real emphasis on technique. If you're making a living printing other people's prints this makes sense. Your customers might be very exacting. But when I look at books on printmaking my eyes often glaze over. They may be technically accomplished but they seem dull to me. Of course printmaking really is the people's art in the sense that anyone can do it if they use a simple medium like linocut. So I often see prints that I like online. Amateur prints sometimes seem more direct. In any case this is all to say that I don't have good printmaking technique. But as I've continued half-way through year number two of linocuts I'm beginning to feel more comfortable with some technique. Probably my biggest and most unpleasant surprise as a printmaker was the difficulty in getting a good, clean print when I printed an edition. By that I mean one where the flat colors were fully inked, without any blooms of missing ink, and yet where lines of white stayed white and didn't fill up with the ink. Too much ink so that the flat areas were fully saturated and then the lines also filled in with ink. Or vice versa. Then there was the struggle with pressure on the baren, the device used to put pressure on the paper that sat on top of the inked block. Too little pressure and the ink on print was too light. Too much and not only might the incised lines fill in with ink but the paper also might start being pulled apart, one little lint-filled piece at a time. If I had my own press I wouldn't need to worry about the pressure applied on the baren. But I'd probably have other more complicated problems. So until I have a waiting list to buy my prints I'll stick with hand pressure using a baren. I often expect the actual printing of an edition to be somewhat grueling. Will the combination of ink, paper and baren work correctly? Will I get a good edition of the size I'd hoped for? Above is most of the printed edition. I was quite happily surprised when this edition proved to run quite smoothly. I used a fairly new ink, which I haven't used much, Caligo Safe Wash Ink, an oil based ink that can be cleaned with soap and water. I also used a new paper: Rives Heavyweight. I've used Rives BFK in the past but it seems too think and unabsorbent for hand rubbed linos. I've also used Rives Lightweight but sometimes it seemed too light and apt to tear. (Well I'm afraid I was mistaken here. A few days after posting this I needed to organize some prints for a competition. As I did so I had to add the specifics for each. As I did so I realized that most of them were Rives Heavyweight! I'd only recently turned to Lightweight and had completely forgotten the many prints with Heavyweight). And finally I used a new Speedball baren that I received for Christmas rather than the bamboo barens I had been using. I'm not sure what the main factor was but they all worked together beautifully. In the final analysis the most difficult part was signing them. First I forgot that it was 2012 not 2011. 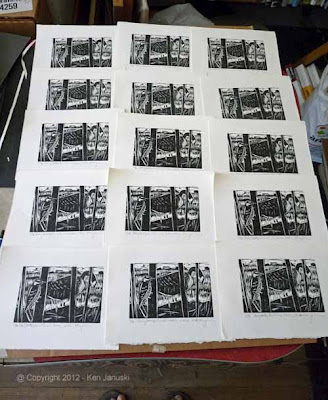 In printmaking an edition is usually labeled in the form of 1/12, meaning print 1 of an edition of 12. I knew that there was a problem when I went to write 13/12 today. Oops the edition was 16, not 12. 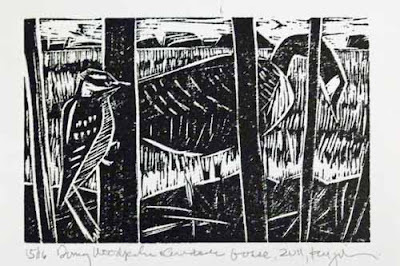 I've done a fair amount of work on the linocut of the Downy Woodpecker and Canada Goose since I showed the earlier states here. But the late April/early May weather here has made it hard to stay inside and work in the studio. Today we were near Flatrock Dam along the Manayunk Canal in the morning. In the roiling waters perched on a huge slab of stone stood a gull I didn't recognize. That doesn't say much since I just don't know gulls. Often I see a mature Great Black-backed Gull there. But this bird looked more slender, though possibly as large, and definitely didn't have the rich charcoal gray of the mature Great Black-backed. I tried a couple of field sketches, in lower right corner above, but they don't show much. One thing that struck me was the long and seemingly slender neck. He also looked pear-shaped from the front. That's what these two sketches tried to capture. I also took some photos. And though the gull was quite distant I was able to do some sketches based on them. Drawing them helps me often to see things I wasn't sure of when I saw the bird live, like just how big the bill is. Seeing the bird live I noticed most his slenderness, at least around the neck. That made me think it wasn't a Great Black-backed. But birds can often look more slender than normal when they stretch our their neck. As I drew the huge bill I came to the conclusion that it was a Great Black-backed, in spite of the seeming slenderness. I also was quite taken by the roaring and roiling water around him. I've never tried to paint such a scene but today I just had to. 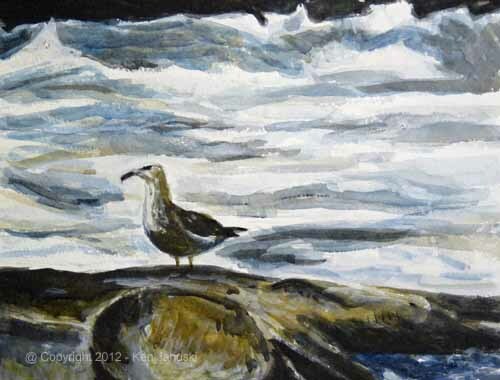 One of my friends has spent a lot of time recently painting seascapes. She knows how complicated they are, how important it is to begin to understand water. I don't. But I still felt like I just had to give it a try. Above is the latest stage of the lino. I haven't touched it in a couple of days. If we ever get some bad weather I'll get back to it. I am happy with it and would like to print an edition. But this good weather can be very distracting. 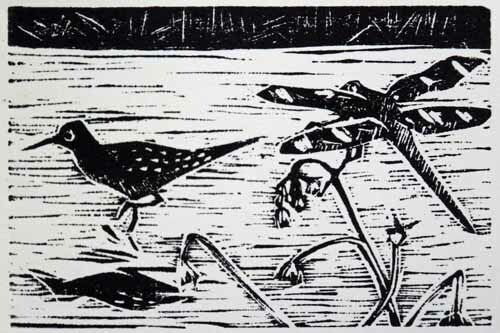 You might think that with a new baren, a new copy of Robert Gillmor's 'Cutting Away' and a stack of new printmaking paper all in the studio as of late 2011 that I'd be eager to get back to linocuts. Perhaps, but I just never could convince myself of a subject. I have considered a couple subjects including the first version of the Solitary Sandpiper with the Twelve-spotted Skimmer but I just couldn't convince myself. This Tuesday I spent over four hours wandering around the wetlands of Morris Arboretum. I kept hoping for first of year Kildeer or Eastern Phoebes. No such luck. 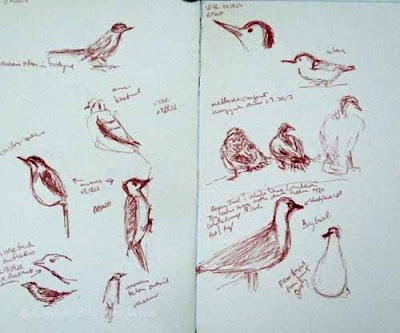 Even the birds I did see weren't very close so I didn't get good field sketches either. I at least hoped to see again the first of year Swamp Sparrow that we'd seen on Sunday. They're a subtly beautiful bird. While buried in a shaded scrubby area hoping for the Swmap Sparrow a Downy Woodpecker flew in. Soon a Canada Goose wandered by behind him, prospecting the sunny grass for food. 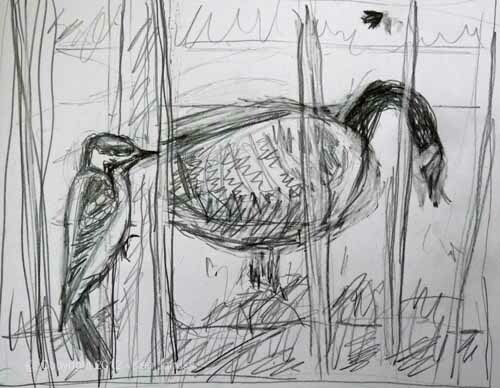 At the bottom right of the field sketch above I hurriedly sketched a little thumbnail of the scene: Downy in shade, with big lumbering Canada Goose in the sunshine behind him. As I thought about doing a new print I liked the idea of developing this tiny sketch. That is what I did above. 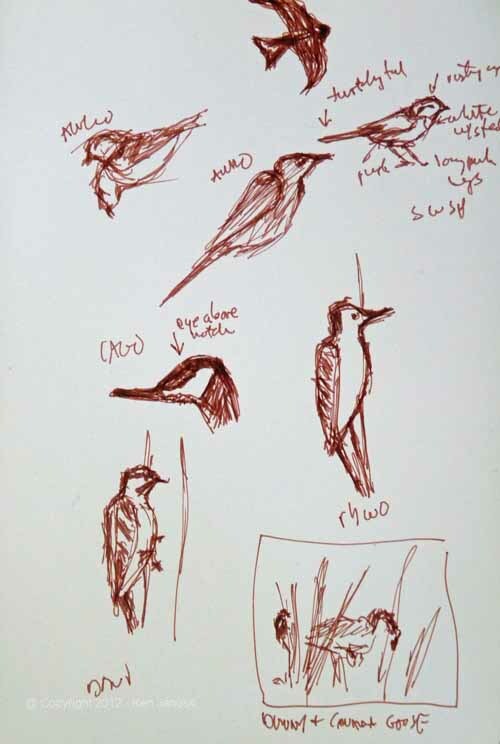 I also made some unsuccessful attempts to sketch the newly arrived Tree Swallows in flight. They didn't work out at all but nonetheless I decided to incorporate one in the sketch and two in the lino. They're so small and indecipherable that they may disappear from the lino before I'm done. But for now they stay. This is about proof number 5 or 6 on the lino. The block is tiny at 4x6 inches. But sometimes smaller prints lead to greater freedom. I rarely like the appearance of a lino at this early stage. But I'm happy with this one. This is done with cheap ink on printer paper. Once it's more developed I'll turn good ink on some of that new printmaking paper. And the watercolor of the Swamp Saprrow, which I finally saw and photographed, will have to wait. About twenty years ago we ordered a number of small booklets on gardening from Storey Publishing. One of them was about cold frames. I built a cold-frame based on one of the plans in there soon after we got the book. When I took my very first college art courses at City College of San Francisco there were a number of courses in design. I always was puzzled as to just what design was. Over the years I began to realize that good design was a combination of aesthetics and utility. Something that was well designed did the job it was supposed to do and it did it well. If it seemed elegant then it had aesthetics as well. When you use something that is well designed you take a real pleasure in it. That was the case with the cold frame. It was collapsible so that I could take it apart easily each year when the weather had gotten too warm to need it, then put it back together in late fall. Finally it started to fall apart, not through bad design but just through the rot that occurs when wood spends too much time in contact with earth and water. The tops, which were just old windows I'd picked up off the street, eventually fell apart. So last fall I constructed new wooden frames for some all metal and glass windows I'd also picked up off the street. As I built them I wondered if it was worth the expense of wood and time. For all my admiration of the cold frame's design I found that I never used it well. We left crops in the garden so late in the fall that by the time I'd harvested them and put up the cold frame it was almost too late to plant anything. What I did plant often stayed dormant until spring, then quickly went to seed. 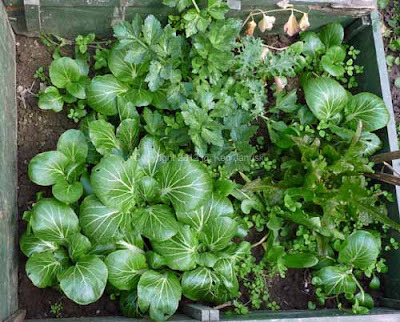 The one good use I made of it was a way to harden off new seedlings and transplants in spring. But last fall I managed to get a number of choi seedlings in along with a few volunteer transplants from other parts of the garden. Against my better judgement I also planted some mache in late November even though the instructions said that they should not be planted when the weather was not reliably in the mid 40s or higher. What wonders a very mild winter can cause. The cold frame has been bursting its top with chois. An heirloom lettuce threatens to do the same, as does ah heirloom celery. In other sections of the cold frame rows of mache herald the beginning of spring with the bright lime green of early foliage. We've had some of the choi for supper the last couple of nights. There's always a sign of incredible optimism, a sense that all's right with the world, when we're able to have the first food from the garden for the year. I'm sure that optimism will continue as new birds arrive daily and plants begin to spring up. Now back to the drawing board. Not much to say here. I was talking to some beginning birders along the Wissahickon the other day and the woman mentioned how much better she'd gotten with identifying birds after buying a CD/DVD of bird songs. Her husband said why don't you just buy a smartphone instead? She said no thanks, and I agreed. Later that got me thinking about the term smartphone. I know why they're called that but sometimes the end result seems to be to make people seem stupid. So a cartoon regarding this has been rattling around in my head for about a day. I've never done one before. And maybe I never will again. 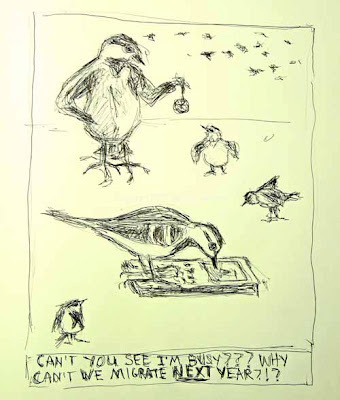 You can blame the wonderful bird cartoons by Gene Holtan in 'The Ardent Birder' written by Todd Newberry for spurring me on toward doing one. I really need to reread this book. The cartoons themselves are charming, probably the best bird cartoons I've ever seen. It sounds like the caption on the newest Roy Lichtenstein painting, sold for so many millions. But instead it was my wife's greeting as I showed her my sketchbook when she asked for the results of the newest Woodcock Walk at The Schuylkill Center for Environmental Education. She had intended to go but a late winter cold forced her to stay home. 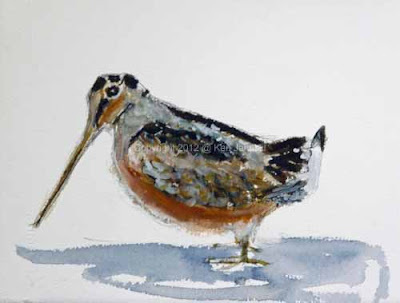 Supposedly the commonest shorebird but you would never know it. I was really struck when I read that after returning from the walk. We've seen four in our life, possibly more. We've flushed them when almost stepping on them in Philadelphia and in Shenandoah National Park. We've seen them sit in front of us and close to 100 other people along the boardwalks of Magee Marsh in Ohio, almost invisible in the leaf litter. And we've also seen one or more in display flights at Black Swamp Bird Observatory near Magee Marsh in Ohio. The walk at the Schuylkill Center was hoping to hear their 'peent' calls then see them do their fascinating display flight at dusk. And though the weather seemed perfect, warm and somewhat calm, we neither heard nor saw any. I don't think that is unusual for woodcock walks. As I recall the walk leaders at Black Swamp also said they'd turned up empty some nights. Still it's always worth the effort to see this fairly rare display. Far better than anything that might be on TV web or in Tweetville or Facebookland. But that is nature. The woodcocks don't operate according to a schedule based on entertaining humans. There is one more organized walk at SCEE next Tuesday to try again. The little trick I was able to play on my wife and provoke the envious explanation was due to a taxidermy specimen that was shown at the center before the walk. As I'd been out sketching and had my sketchbook at hand I took advantage of the opportunity to sketch it. I may have shortened it a bit on the right as I neared the edge of the paper. But much of that odd, unbalanced look is accurate. As a sometimes outdoor painter I'm always looking for a way to be able to paint outside with minimum fuss and weight. I quickly learned that you need at least four hands: one to hold the drawing surface, one to hold the paints, one to hold the brush and another to hold the binoculars as you look at the bird. Actually you need a fifth to hold a water container. That makes five hands. If you have a scope set up then it's back down to four again since it stands on its own on a tripod. You see the problem. So I've experimented with various kits. None has really worked well. If you sit down there is some possibility of success as you can then use your lap as a table and support one or two things there. But most times the only place to sit is the ground and cold or wet make that unappealing. There are almost never seats where I bird. So this week I bought a Guerrilla Painter Thumbox, a small pochade box with a thumb hole on bottom to hold it in one hand. When you do this and open it up the cover becomes an easel for a 6x8 watercolor sheet, while the rest serves as a palette. In theory it should take the place of two or three hands. I tried it out briefly at SCEE without much success before the woodcock walk. A couple of young visitors at my side recommending various additions to the painting didn't help but it was already ruined by the time I gave in to their suggestions. It was difficult not to take part in their enthusiasms. "Put in some red, mister!!" One of the problems was that I didn't have a watercolor block that was 6x8 inches or even anything close. So I ended up cutting some Arches Cold Press #140 pound paper to fit. One thing I often find with this paper is that the paint seems to leap off the brush ending in an ungainly splash or splat on the page. I really don't like it and feel as though I have no control at all. So when I decided yesterday to try to combine my woodcock sketch, photos from Magee Marsh and reference photos from guides into a watercolor I decided to use a sheet of that paper. I assumed I wouldn't be happy with it but it seemed smart to keep testing it until I got comfortable with it. Thus the next time I took the thumbox into the field I might be a bit more successful. Well the splat and colors running into one another continued apace here. I tried to salvage something with white gouache but it's still pretty bad. Nonetheless it serves to illustrate both the woodcock and the new method of outdoor work. And the whole post serves as an advertisement for Schuylkill Center for Environmental Education. It's not often you can see something so primordial in nature. Check the SCEE link above for the time of the next walk. It's a great opportunity. On our walk we were also treated to a full moon as we stood in the meadow waiting for the woodcock to appear. As I said much better than anything happening in Tweetville or Facebookland even without the woodcocks. That was the large type quote in today's Wall Street Journal obit on ceramic artist Ken Price written by Peter Plagens. It immediately got my attention. I don't let my feelings about contemporary art theory slip out much on this blog. I'm sure that they do occasionally. I'm much more open about them on my main web site. I also believe that art theory is pretty worthless, or at least debilitating. It's so easy to waste your time thinking about art and the art world rather than undertaking the far more rewarding and satisfying task of just making art. So I assume very few readers of this blog are interested in my thoughts on the subject. But sometimes things just bother you and get under your skin. I looked at an online application for a local juried art show today. It will explore the 'themes and ideas that are current within the arts of Philadelphia.' Uh, oh. That most likely rules me out. I don't even know what those ideas are. What's worse I'd be willing to bet I'd think that they were utter nonsense if I did know. (So by now you can probably see why I don't write about this much here!). In any case the notion of ideas in art is always under my skin, like a nasty thorn. Part of Price's uniqueness -- particularly in today's logorrheic, theory-besotted art world -- was his straightforwardness. 'Theory-besotted art world.' I couldn't have said it better myself. It's the main reason I turned from abstract art to naturalistic art 10-15 years ago. I can't prove that my art's any good or that it means what I say it means. And nothing I can say can improve the way it looks. I think that this is at the heart of my view on art, whether it's abstract, naturalistic or anything in between. The only thing that's important to me is how it looks. Just as with music I care about what it sounds like. This would seem to be a simple, self-obvious statement. But in the bizarro world of art nothing is self-evident other than the one fad will follow another. Well, as I said, not many people who read this blog I suspect are very interested in this type of thing. They're interested more in nature or naturalistic art I think. But even for them I think the importance of what something looks like is worth mentioning. I said yesterday that I don't get much satisfaction out of working from photos, even if the work turns out fairly realistic. 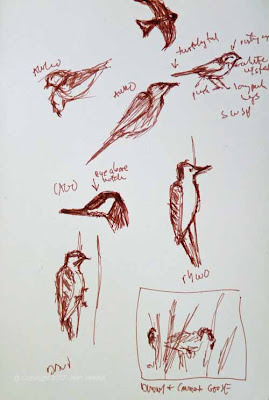 I'm happy with my recent ballpoint pen drawings of wood warblers. But they seem to me more like exercises than anything else. And in fact they were I did them mainly to learn. 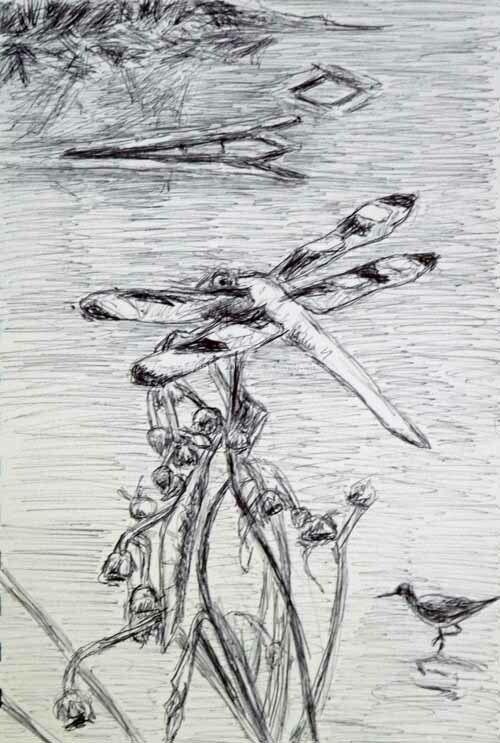 I also tried to make drawings that were pleasing to look at and that somehow captured the bird. But there was still a bit of 'exercise' in them. By contrast I'm now trying to create a print or painting of the Twelve-Spotted Skimmer and Solitary Sandpiper that I saw last summer at Morris Arboretum. Yesterday's ink and watercolor wash drawing was one attempt. Today I changed it to a vertical format, moved the shorebird and added some foliage and fallen trees in the water. To me this is what art is all about, regardless of subject, trying to make something that looks good, just like Ken Price. 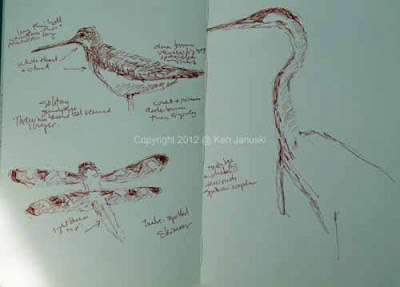 Most of the bird and wildlife artists that I most admire use their sketchbooks as the source of subjects for their work, not a collection of photos. Some use photos but only to check the details at times, never as the source of inspiration. This makes sense to me. And yet it's far easier for me to start working on something by looking at a photo rather than by looking through my sketchbooks. There's just one problem. The work based strictly on photos always seems like an exercise. It may be educational and I may capture a likeness. But there's generally something missing when I look at it. The problem with using my sketches as the source of artwork is that I really have to use my imagination. There is often too little in the sketches for my mind to make the leap from skimpy sketch to full-fledged idea for artwork. But when I do I find that I'm able to call upon my imagination, to start putting together a scene based on various sketches. That's the case in the ballpoint pen sketch with dabs of watercolor above. I've always liked the sketches I did last summer of Twelve-spotted Skimmers. In this case I also liked some of the photos I took of them on dead wildflowers. But the photos were never enough to engage my imagination. 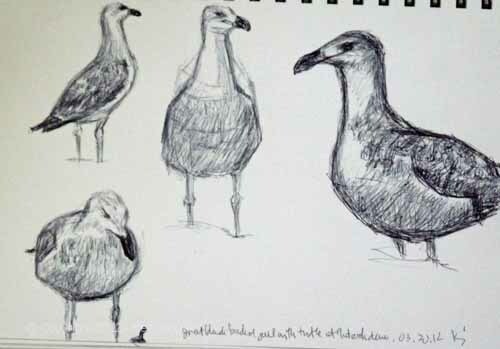 The sketches however, especially when combined with other wildlife seen that day, were enough to get me started. I never saw this particular scene. But the bird and dragonfly were very close to each other, one in the water the other along side of it. So that was enough to make a plausible scene and that's what I've tried here. It's just a small 6x8 sketch. But it may lead to a larger painting or to more experiments with this subject. And all thanks to a sketchbook full of field sketches.